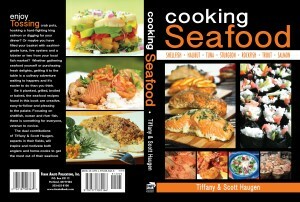 The halibut fishing season is happening or coming up soon all across many marine areas, and cookbook author Tiffany Haugen who has a passion for preparing Pacific Northwest seafood, and will be contributing some of her delicious recipes for the Reel Time Northwest Fishing blog. Each of her recipes will be related to the “catch” of the week. This season we have weekly recipes and advice from May through October on how to cook up and dish out a wide variety of local seafood by experts like Chef Tom Douglas; Anthony’s Restaurant; Tiffany Haugen, Outdoor Cooking expert/author; tackle shop owners; local seafood-market owners; and fishing guides and charter services. Chop fish into bite-sized pieces. In a shallow dish, spread fish in a single layer and drizzle with lime juice. In a small bowl mix spices until thoroughly combined and sprinkle over fish. Let sit 10 minutes at room temperature. In a large skillet, sauté fish in oil on medium-high heat 5 minutes or until fish is no longer opaque. Serve in double tortillas topped with cabbage, carrot, Avocado Cream Sauce and lime for garnish. In a small bowl, whisk all ingredients until thoroughly combined.